The World Wide Web and advances in Open Source Software have led to an eLearning Revolution, where students can access a plethora of learning materials, easily and conveniently. This has been propelled by the Hardware Industry where the processing power of computers is doubling every 18 months (Moore’s Law) and yet the prices either reduce or remain the same. All these advantages have not trickled to the majority of the population in developing countries. Many developing countries don’t have high speed internet access, due to a myriad of factors including but not limited to intermittent electricity, use of expensive low bandwidth satellite technology, and inadequately trained personnel. Internet access is less than 10% in Africa alone. Fortunately many countries have started deploying nationwide backbone ICT infrastructure, built on high speed fiber cables. Several countries in East and Southern Africa have also invested in undersea cables to tap the global Internet super highway. In order for developing countries to accrue the benefits associated with e learning, they need to think of innovative ways to deliver online content on the national backbone, instead of relying on the unreliable and expensive Internet. Private institutions such as banks are already using the backbone to inter connect different branches country wide for their transaction processing needs. Another challenge for implementing eLearning is training of academic staff in the use of ICTs to deliver online training. With academic staff over burdened by large student numbers, the introduction of eLearning is prone to face stiff resistance. Several academic staff members are not conversant with the use of computers, even for basic tasks like word processing. To expect staff members to deliver online training using technology they are not familiar with is no mean feat. This technology has to be rolled out through use of blended learning and an incentive structure is paramount. Universities and Institutions of higher learning need dedicated eLearning Support Centers that can convert learning materials into digital formats. Such a facility can provide training to academic staff and students who don’t have the skills in elearning. 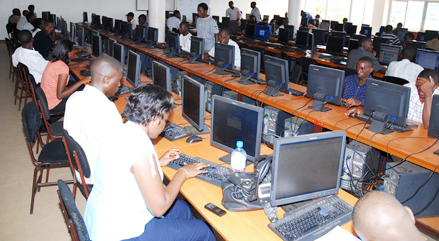 Students also need to be trained in Foundation ICT courses before starting their main course programs. The majority of students who join tertiary institutions also have inadequate skills to engage in e learning. ICT foundation courses should be mandatory for students, who don’t have the basic computing skills that include Word Processing, Email & Internet. « eLearning’s Promise: Will New Models Scale to Educate Youth? Written by Cavin Mugarura on March 16, 2010 in eLearning Promise. I welcome your emphasis on the need for training in order to make the most of new opportunities provided by greater on-line access. In our experience in Nigeria there are two parts to this training challenge. One is learning about computers. The other is about attitudes to learning. Local teaching tends to be rote learning, and students are not expected to ask questions. Questioning is not seen as good involvement and interest. Instead it is seen more as a challenge to authority, or as a suggestion that the teacher has not explained well enough. This leaves many students ill prepared for a questioning approach to their studies and the challenges of being self-directed learners making their own way through eLearning materials. I imagine this is less of a problem in urban areas and with elites. How does this issue relate to your experiences? While developing countries wait for the realization of a national backbone ICT infrastructure , developers and innovators should do more with using mobile phone as a platform for eLearning (mLearning) where contents are delivered via text messaging. i will bet that this is the most innovative I have seen. Learning about living has a good model of this ICT4E concept. @Pamela_McLean, that was a good observation on local teaching in Nigeria, this is more of a cultural issue and it might take some effort to change this. Is the Learning for Living project still running? If new people can join in then I would like to know how (so that I can pass on the information to some teachers and health workers I know in rural Nigeria). Also, I appreciate the phone follow up as a great example of non formal mLearning – no exams, no certificates, no set curriculum – just an opportunity to learn. Once the area of interest had been defined, people were encouraged to ask questions and answers were given. People were learning because they wanted the knowledge, not for some other objective. It often seems to me that most people only think of formal traditional learning when they discuss mlearning. Is that just my impression or do others get the same feeling? Thanks for sharing this excellent video. @Pamela_McLean The LaL is still active and they are currently working to scale-up and extend the program into hundreds of schools and community centers across Nigeria’s six geopolitical regions. I could get some information for you on how to participate. On informal or formal traditional learning, I believe the end should justify the means. If behaviors are changed for good, life becomes better, people are more healthy, young people make good life choices, etc then the approach is justified. And as Ian Thomson rightly said, content is king. If the information is not making any impact on the target audience, the platform and the method are altogether useless. Great news that The LaL is still active. Please do get me information for Nigeria. What of Cameroon? One of my contacts there (Zoneziwoh Mbondgulo http://www.facebook.com/zoneziwohis) is involved in a health workshop next month. It would be good to get information to her about LaL, so she could find out if it would be relevant for any of the participants. I agree with you completely that the important thing in eLearning in Developing Countries is results. Don't we all agree that the point of having the technology and the information is to serve a genuine purpose for real people, and to do that as effectively as we can? Sannu Pam, , I attended a workshop last year hosted by LaL team. We have been using LaL since 2008 for Children Computer Club activities. It is a great learning tool. It is interesting to get your feedback ref LaL. (How did I miss a demo of it last time I was at Fantsuam ? Probably I spent too much time looking at People and Place http://www.peopleandplace.co.uk/ with the Childrens Computer Club.) Please give me more info about it, either here or outside this discussion. Is it just being used with the children or is it also used with other parts of Fantsuam Foundation's HIV/AIDS outreach work? I realise there are big logistics issues in sharing it more widely – given that the Children's Computer Club has the advantage of happening at the Fantsuam Foundation site, but the HIV/AIDS programme involves a lot of outreach in hard-to-reach places with minimal infrastructure. BTW – Welcome to this discussion and to Twitter . Mobile learning (m learning) is possible. There is an application called epocrates (epocrates.com), that can be helpful to students learning Pharmacology (Doctors/Nurses/etc). It's only limitation is working on smart phones. m Learning can be helpful, but the limited memory space of most phones, means you can only deliver basic learning materials, usually Text. To setup a two way m learning center in a university would require a lot of investment, which is out of reach for the majority of Universities/Educational Institutions in Developing countries. A Cheaper alternative is to send periodic information to students. Some experiences have shown that providing students with a relatively advanced ICTs for their learning benefit must be with a serious and active participation of teachers in the class. Introduction on how deal with is so important in order to avoid a beyond time of necessary use – just for fun or wonder. However, students still have collected a better quality of education when the teacher has been there to be a mentor of innovative thought, especially when a balance portion between practices in the field have an ample portion in the whole time of learning. One of many more impressive blogs Ive seen. Thanks so much for conserving the web elegant for a change. Youve got type, class, bravado. I mean it. Please keep it up as a result of without the web is unquestionably lacking in intelligence.